A mix of good and bad news to report regarding our ability to offer virtual visits. At this time, our ability to offer this service is temporarily offline. Virtual visits will return soon to Tampa Veterinary Hospital. We completed dozens of virtual visits with our patients throughout the late summer and fall- and we are still committed to offering this service in the near future. The previous web-based platform we were using- LiveDVM- has been sold to another company. They are in the process of making some big improvements, and taking the platform to a dedicated application instead of using a web-based browser platform. 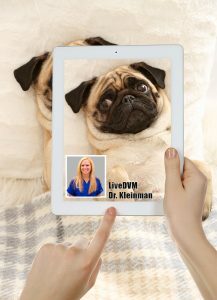 In the short term, it means that we can not do virtual visits with your pets, as LiveDVM.com is no longer up and running. In the long term, it means that the virtual visits we have in the future will be even better with more features and a dedicated app to be used on your smartphone or wifi enabled device/tablet. We apologize for any inconvenience this may cause. We expect to be able to see your pets in cyberspace sometime in the spring. As soon as we have more details, we’ll break the news. Thanks for your understanding.